Whisk together the dry ingredients in a large bowl. Whisk together the egg and yogurt in a separate small bowl and mix into the dry ingredients until incorporated. Mix in the melted butter. If the batter seems too thick, stir in 1 – 2 tablespoons of water. Heat a heavy cast iron skillet over medium-low heat. Add 1 tablespoon of fat of your choice. Using a 1/4 cup measuring cup, pour batter into hot skillet, 1/4 cup at a time, spacing the pancakes out and being careful not to crowd the pan. Cook until bubbles appear on the top and edges look brown. Flip and cook the other sides one more minute or until browned. 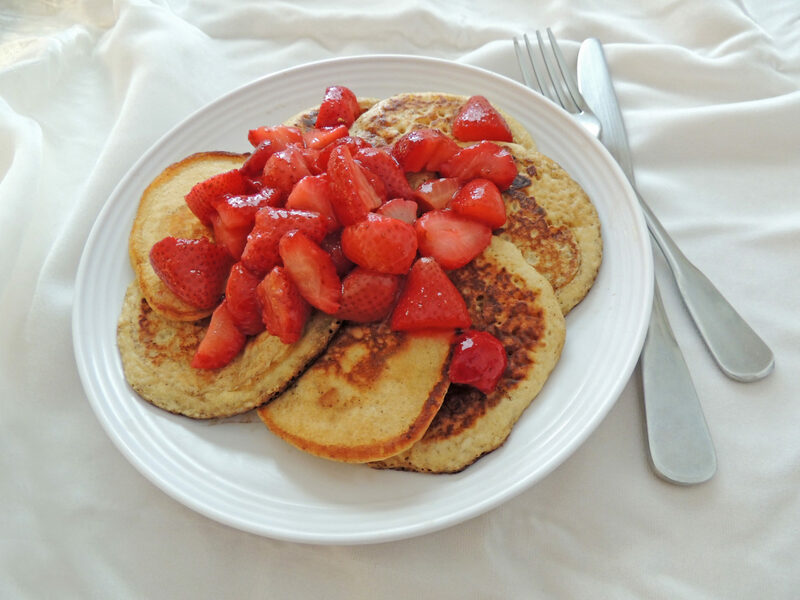 Place pancakes in a warm oven while cooking the rest. Add more fat as needed to the pan as you cook the remaining pancakes. Serve with maple syrup and fresh fruit. Makes about 16 3-inch pancakes.